With a 3.8x wide-angle to telephoto zoom range, this compact and versatile lens is ideal for all of your general photography and videography needs. From breathtaking landscapes to stunning portraits, it covers the popular 18–70mm zoom range with exceptional clarity, sharpness and color reproduction. 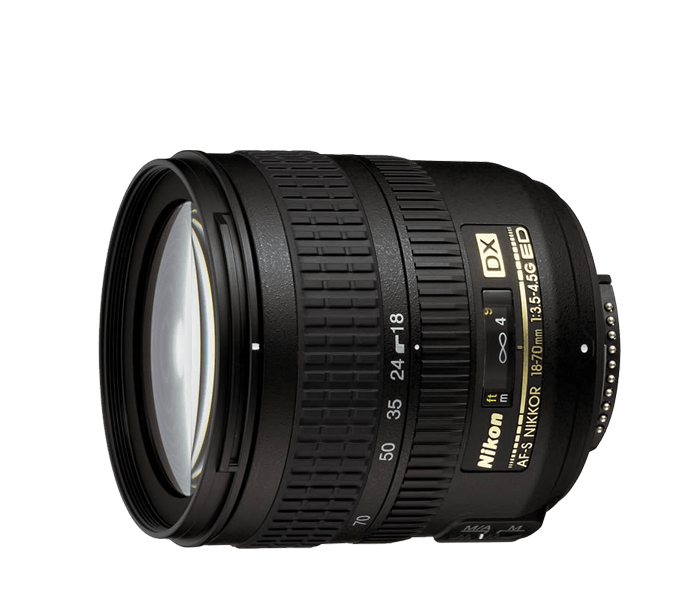 The AF-S DX Zoom-NIKKOR 18-70mm f/3.5-4.5G IF-ED is a fantastic all-purpose lens. Whether shooting a majestic landscape or a dramatic portrait, you’ll capture every detail with outstanding precision. The multi-purpose AF-S DX Zoom-NIKKOR 18-70mm f/3.5-4.5G IF-ED’s 3.8x wide-angle zoom meets the demands of all of your day-to-day photo and video needs with ease and expertly and effortlessly delivers brilliant works of color and clarity. The AF-S DX Zoom-NIKKOR 18-70mm f/3.5-4.5G IF-ED empowers your Nikon D-SLR camera to achieve peak performance. Optimized for DX cameras but compatible with all Nikon D-SLRs, advanced Nikon lens technologies ensure you'll capture rich, stunning photos and videos in a wide variety of shooting situations. Unleash your potential.